Dahlia Ravikovitch דליה רביקוביץ - Dahlia Ravikovitch was an Israeli poet and peace activist who born in Ramat Gan on November 27, 1936. She learned to read and write at the age of three. When Dahlia was six, her father was run over and killed by a drunken driver.After completing her service in the Israel Defense Forces, she studied at the Hebrew University of Jerusalem. She worked as a journalist and high school teacher. She translated WB Yeats, TS Eliot, Edgar Allan Poe, and Mary Poppins into Hebrew. Ravikovitch was active in the Israeli peace movement. 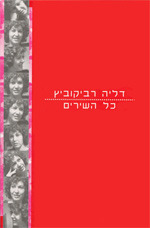 From her home in central Tel Aviv she collaborated with artists, musicians and public figures seeking peace, equality and social justice.Ravikovitch's first poems appeared in the Hebrew language poetry journal Orlogin (Hourglass), edited by Avraham Shlonsky, and it was Shlonsky who encouraged her to pursue writing as a career. Her first book of poetry, The Love of an Orange, published in 1959, established her as one of Israel's leading young native-born poets. Ravikovitch published ten volumes of poetry in her native Hebrew. In addition to poetry, she contributed prose works (including three collections of short stories) and children's literature, and translated poetry into Hebrew. Many of her poems were set to music. Her best known poem is Booba Memukenet (English: Clockwork Doll).Her poems are taught in schools, and several were turned into popular songs. Her poetry has been translated into 23 languages.